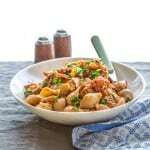 Years ago I shared this recipe for Healthy American Chop Suey, and to date it is a favorite here on Healthy Seasonal Recipes. I pulled it out of the archives today, spruced up the photos and made a fun one-minute video for you. Mostly I did this because I wanted to make sure you knew about it and show you just how crazy easy it is. Check it out! As I shared in my original post, titled Bison Bolognese, this dish is known by a number of different names that vary by region. My husband grew up calling it Chop Suey, but in the Midwest it is known as Goulash or Slumgullion in some parts. Whatever you call it, we love it in this house, especially when it is healthified! What Makes This American Chop Suey Healthier? Whole Wheat Pasta—whole wheat pasta is higher in fiber and will keep you satisfied longer. I used 2 ounces (dry) per person which is actually the recommended serving size. So many pasta dishes have double that! Grass-fed Beef—grass-fed meat is naturally leaner (I used 92% lean.) The fat that it does have is higher in beneficial Omega-3s and CLA. If you can, try to find a local grass-fed beef. Lots of Vegetables—this recipe is loaded with vegetables. The vegetables double the serving size. The trick is to use a food processor to make this an easy step. Using the steel blade attachment, drop the garlic through the feed tube while the motor is running. Then add in roughly chopped carrots and celery and chop them fine with the blade. Last add in some chunks of peeled and cored onions and pulse them to chop them up too. Because they are so finely chopped they really melt into the sauce. Lots of flavor—I used Italian Seasoning mix since it is so simple, plus red wine. Wine helps to make the flavors in recipes more pronounced. If you can find them the Muir Glen fire roasted canned tomatoes make this even better. All this flavor, combined with the garlic and onions, stands up to the taste of the whole-wheat pasta and tames any gaminess of the grass fed beef. This healthy American chop suey comes together in about 45 minutes and is really easy to make on a busy weeknight. Use a food processor to chop the garlic, carrots, celery, and onion to speed up prep time. Then, brown the grass-fed ground beef and add in the vegetables. Cook the mixture until the veggies cook down slightly and brown. Stir in some dry red wine an continue cooking until most of the wine cooks off (this will take a good three minutes or so). Finally, add in some chopped tomatoes and continue stirring until the sauce thickens slightly. And that’s it! Stir in the cooked pasta when you’re ready to serve this American chop suey, and watch as your family gobbles it down. Do you chop vegetables in your food processor for fast weeknight meals? Do you find grass-fed beef gamey or whole-wheat pasta too strong? What do you call this pasta and meat sauce recipe in your neck of the woods? 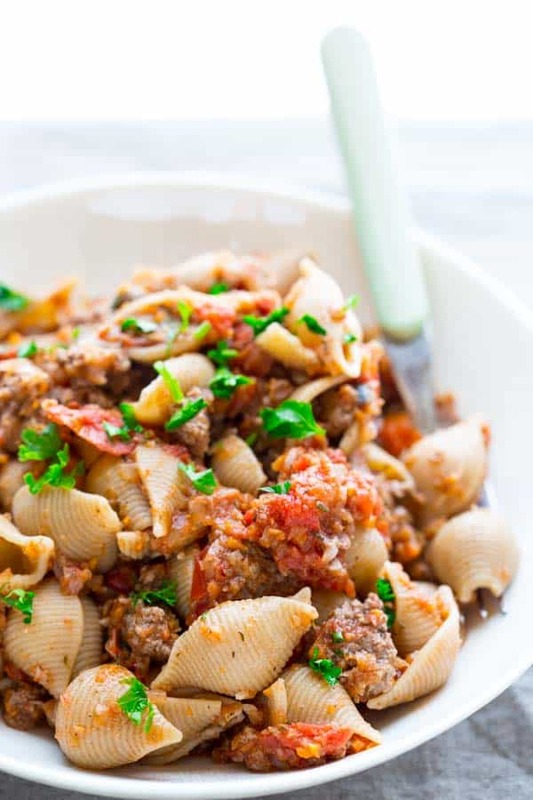 Whether you call this Chop suey, goulash or slumgullion this healthy version is a delicious family friendly meal. Made with loads of vegetables, whole-wheat pasta and grass fed beef. Meanwhile, fit food processor with steel blade attachment, close lid and turn motor on. Drop garlic through feed spout and continue processing until the garlic is minced. Open lid and add carrot and celery. Process until the carrot and celery are finely chopped. Open lid, add onion and pulse until the onion is roughly chopped. Alternatively, use a knife to mince garlic, finely chop carrot and celery and dice onion. Heat oil in a large skillet over high heat. Crumble in bison or beef, and cook, stirring and breaking up chunks of meat until browned, 4 to 5 minutes. Stir in the vegetable mixture, Italian seasoning, salt and pepper and cook, stirring occasionally until the vegetables are cooked down and browned slightly, 8 to 12 minutes. Pour in wine and cook until mostly evaporated, 2 to 3 minutes. Stir in tomato and bring to a simmer. Reduce heat to maintain simmer and cook, stirring occasionally until the vegetables are tender, about 5 minutes. Meanwhile, once the water boils, cook pasta according to package instructions. Drain. Mix the pasta and sauce together and serve sprinkled with parsley. To make ahead: Store the sauce (not mixed with pasta) in the freezer for 3 months. Left-overs reheat well in the microwave. Ha ha, yet another name for it. I never really knew what chop suey was (we never called it that) but now that I look at the ingredient list and method, I realize it’s really nothing crazy weird or fancy and totally just like a bolognese! I’ve always called it bolognese too. But here in Vermont it’s commonly called Chop Suey. This exact topic was one of the first arguments I had with my husband when we were first dating. I insisted that Chop Suey was a Chinese stir-fry with chicken. Now I know we were both right. Ha ha. We grew up in Texas, and my mother called a version if this “Yankee Chop Suey.” She used spaghetti for the pasta. My husband’s mother still makes it for her grandchildren and calls it the elegant name of “Glop.” Either way, it is more edible than it sounds. Your version is by far the most healthy and I am sure the most delicious. Can’t wait to try this veggie centric recipe. Hi Ma! 🙂 So nice of you to comment on this today. I never knew she called it that!! I don’t remember you really making this. I of course remember your meat sauce (I think that was the first thing I ever really help you make for dinner) but we always had that with spaghetti. Too funny about Glop! That name that has to go! This reminds me of something Jase told me about that he ate as a kid called Pea Wiggle. So many funny names! My mom had a system: if it contained soy sauce, it was chop suey. 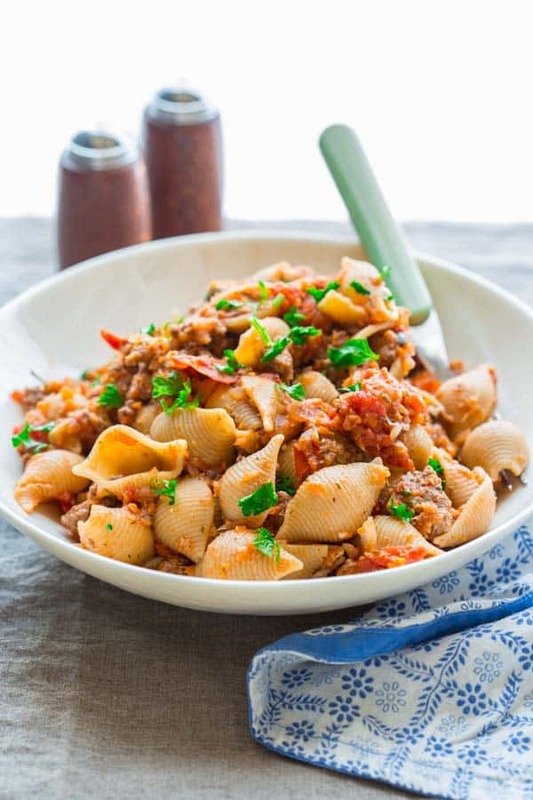 If it had red wine and basil,it was italian; if it contained paprika,it was goulash. And if it could not be categorized easily,but used left overs from the fridge and had no connection to any family recipe,it was slumgullion. She was a fabulous cook!! Love that Kathleen! Ha ha. So did she make a variation of this but added in paprika (for the goulash) or was that another dish all together? This dish has the trifecta “italian seasoning,red wine and pasta” which would immediately make this “italian” in my mom’s kitchen. I grew up on the Iron Range of Minnesota where small mining communities were composed of many nationalities-our area had 23 different languages spoken. !! As a result the recipes that were passed from housewife to housewife were varied indeed. But kids just wanted to know “what’s for dinner?” My mom and the others quickly figured out how to answer this question on the fly- “italian,chinese,german,..” and how to tailor whatever was on hand in the fridge or garden to get good food on the table. 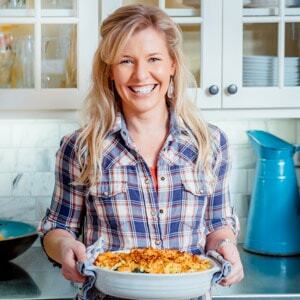 Love your blog,the recipes and your enthusiasm,katie. My Mom made a version of this that she called “Glop”. No pasta. Instead she added boiled potatoes that were cut up. I make a version that has the potatoes that Mom added, but I add fresh or canned whole kernel corn; and we called it “Slop” but loved it. Ha, sounds like you and Robin (comment above) are talking about a similar thing. So funny and both glop and slop sound so unappetizing to me. No matter the name, you’re right it is delicious! I’m glad you say that. That’s what I remember Chop Suey being too. Though my mom’s version of it was totally from scratch and delicious. Those cafeteria memories from school… man they stick with you don’t they. Ha ha. This dish is right up my alley! I would probably just call it bolognese 🙂 Yes, I like to chop of veggies in my mini food processor and use it in dishes like this. Love the addition of red wine for depth of flavor! The food processor trick is the best! It makes this dish so much easier to make healthy. Love it! Sounds like we’re totally on the same page then Crystal. So glad you came by today. Have a fantastic week. I make chop suey but use marinated firm tofu instead of meat. I add peppers, one sweet and one hot. Family favorite. Great idea Merrimack. No need to use beef. I am sure the tofu is great with this sauce. Yum. Just made this today and hubby and I loving it so much! Living in Massachusetts, I have made American Chop Suey many times and was looking for something extra. Your recipe, though I subbed beef for ground turkey and the celery for zucchini, was so delicious! Having more meat and veggies than pasta was ideal and it will definitely be in my recipe keeper list–thanks so much. Looking forward to checking out your other recipes. I am so glad to hear it Anna. I love your seasonal swaps too. Thank you for coming back to let us know that you liked the recipe. Please let me know if you’re looking for something in particular. I love hearing from readers! A few days ago, I made this with ground elk and it immediately became a favorite. I love that the recipe calls for the onions to be finely chopped because my husband is not an onion fan but I refuse to exclude them from my cooking. So this works perfectly. 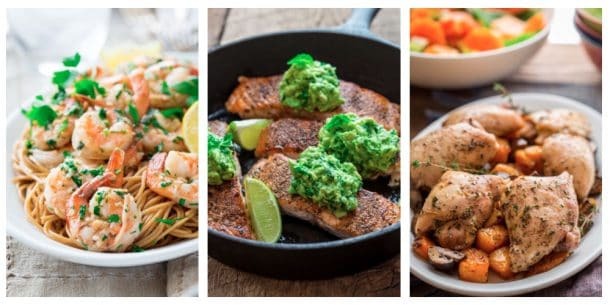 This recipe is so easy, delicious, and healthy. I am probably going to make it again next week! Hi Jessica, First of all, yay that you used elk for this. Whenever we are out west I order it at restaurants because I love it. But it isn’t common here in the Northeast. And second, lol about refusing to not use onions. I totally agree cooking without them would be so sad. Such an easy, tasty family friendly recipe! Mine loved it! Hi Liz, That’s great news! Thank you for coming back to rate and review. I appreciate it. I can see why this is a family favorite! Looks fantastic! Thanks Lindsay. I appreciate it. Hope you’re well my friend. I’ll bet this would taste so good too vegetarian! Hi Suzy. I have never tried that actually. I am sure it would work. It would be more like a chunky marinara I guess. I think mushrooms, finely chopped, would make a great sub for the meat.